There was more than 1 photo of men in blackface in the 1984 EVMS yearbook | Street Talk | Style Weekly - Richmond, VA local news, arts, and events. 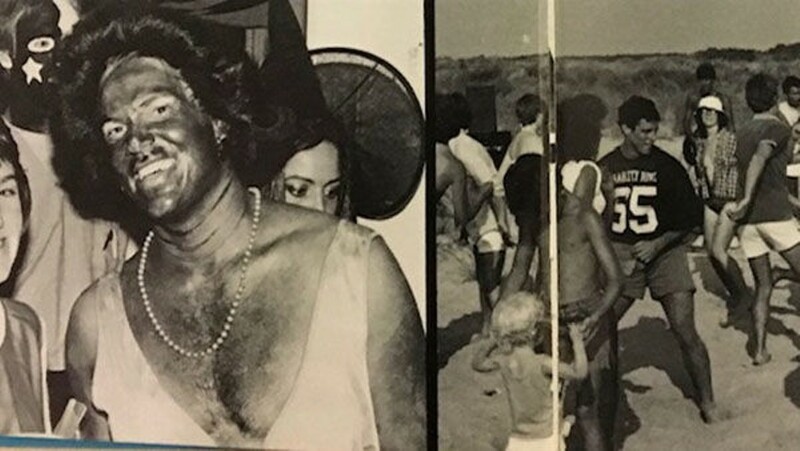 A photo in the 1984 EVMS yearbook shows a man who appears to be in blackface dressed as a woman with caption: "Who ever thought Diana Ross would make it to medical school?" As Gov. Ralph Northam retreats from an earlier admission that he was one of two men in a 1984 medical school yearbook photo dressed in either blackface or Klu Klux Klan costume, many have wondered how the racist photo could have even been published. Eastern Virginia Medical School President Dr. Richard V. Homan said Saturday that he doesn't know either. "I can find no explanation for how such a picture was able to be published in the past," Homan said in a statement posted to the medical school's website Saturday. A page in the 1984 yearbook listing staff thanks individuals who either contributed photos or helped in the production, including the "EVMA Public Affairs Office" and a doctor who "got us over the hill." On Friday, EVMS spokesman Vincent Rhodes had said he wasn't sure if any faculty or staff oversaw the publication. Interviews with EVMS alumni indicate that students were each given a half page and submitted their own photos to be published on those pages. Dr. Kathleen Lovie, who graduated in 1985 and practices medicine in Alabama, wasn't on the yearbook staff but recalled it being mainly student run. She said she remembered looking at her photo arrangement before it was published but didn't know if that was common practice. She happened to be friends with two people on the yearbook staff. “No one questioned me about my pictures,” she said including one she thought might have been questionable because it pictured her belly dancing. There's at least one other photo in Northam's 1984 yearbook of a man in blackface, dressed as a woman with the caption: "who ever thought Diana Ross would make it to Medical School!" In his statement, Homan said it was a time, "for self-reflection and humility. On behalf of our beloved EVMS, I sincerely apologize for the past transgressions of your trust. We recognize the need to address and rectify any issues of racism and discrimination that arise — and will continue to take action to build a strong culture of diversity and inclusion." Homan said that he shared the, "outrage, alarm and sadness," voiced by others, including alumni of the Norfolk school, and said he would convene a meeting of managers and board members to "address this issue holistically." "We will, of course, include students, residents, faculty and staff in this work," he said. "We remain steadfast in reassuring our community that EVMS is absolutely committed to supporting and creating a culture of diversity, inclusion and social equality," he wrote. "We continue to affirm the tenets of our professions and our mission to recruit, educate and train a culturally competent healthcare workforce which reflects the demography of our nation and the patients we serve." Of the 151 medical students who began their first year at EVMS this fall, 29 – or slightly less than 20 percent – are underrepresented minorities, which includes African, African American, Afro-Caribbean, black, American Indian, Mexican, Mexican American, Native Hawaiian and Puerto Rican individuals. Among the nearly 400 new health professions students, the percentage of minorities is about the same. Surgery Chairman Dr. L.D. Britt, who is black and was first hired at the school in 1986, said it was unfortunate that EVMS has been highlighted this way. “At the end of the day, somebody should have provided some oversight for that to have not been published,” he said. Britt, who had no idea how the yearbook had been produced annually, said it would have had to have faculty oversight, though, considering it was treated as an official yearbook to be archived in the school’s library. “This is not a rogue publication,” he said. Britt said he would be stunned if it turned out to be entirely student run. Someone should have said it shouldn’t appear in the yearbook, he said.